The Tam Valley RR is a point-to-point style layout with a branch line. The western end is Sausalito, California and the eatern end is at Ogden Utah. The branch starts from Almonte and continues through Mill Valley and then to hidden staging. The branch has a lot of local switching buit into it. 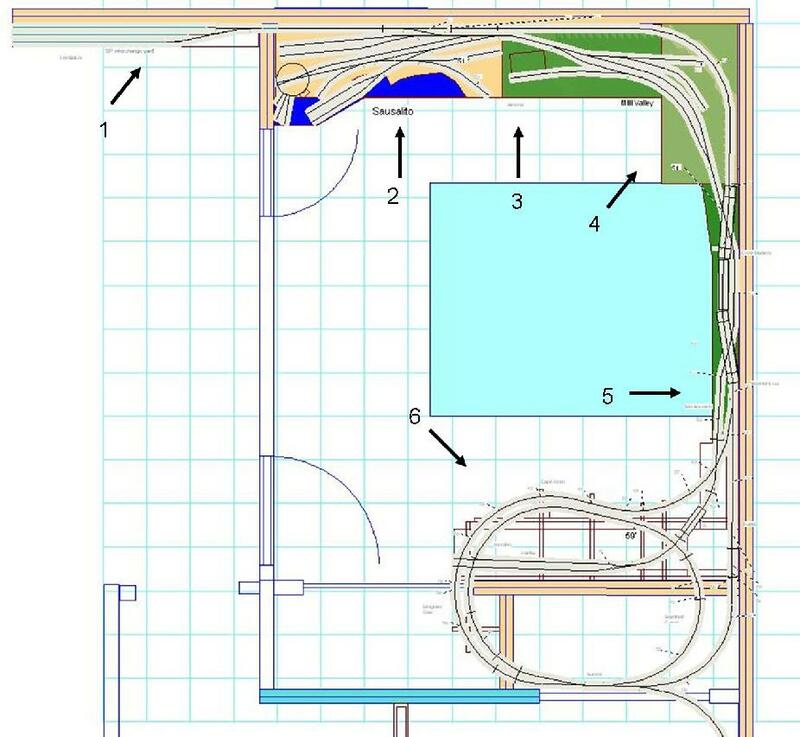 The rest of the layout is meant to be run as a through division with staged trains. There is a reverse loop and a small loop of track for continuous running built into the Sierra Mountains. The reverse loop allows for turning trains between operating sessions and the loop allows for breaking in engines. The trackwork is mostly built on shelves above the dressers and beds of the 3 bedrooms of our house. This ends up having remarkably little impact on living room. Above much of the layout I put a shelf with a valence on the front. On the underside there are compact daylight flourescents and on top there is lots of storage. Addition completed July 2007 through the kids bedrooms. Currently working on finishing the scenery. I divided this area up into 3 seperate scenes plus a big terminal at the end. It gives the feeling of the trains traveling a much longer distance to have the seperated scenes each about one train length long. 1. Western staging - the cab forward is all steamed up and ready to go! 7. At Norden summit. 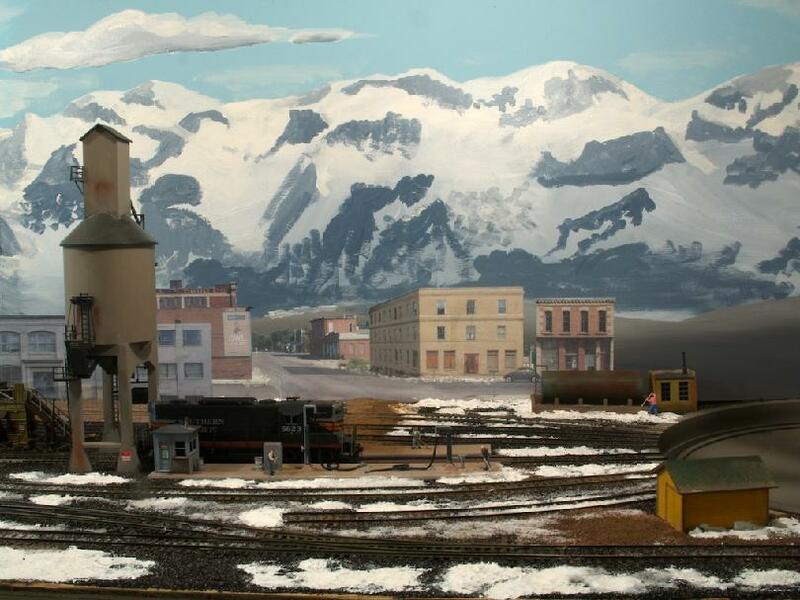 This area is unfinished but eventually will be a snowshed scene. 13. Crossing the bridges across the Humboldt River and into the Palisades Canyon. 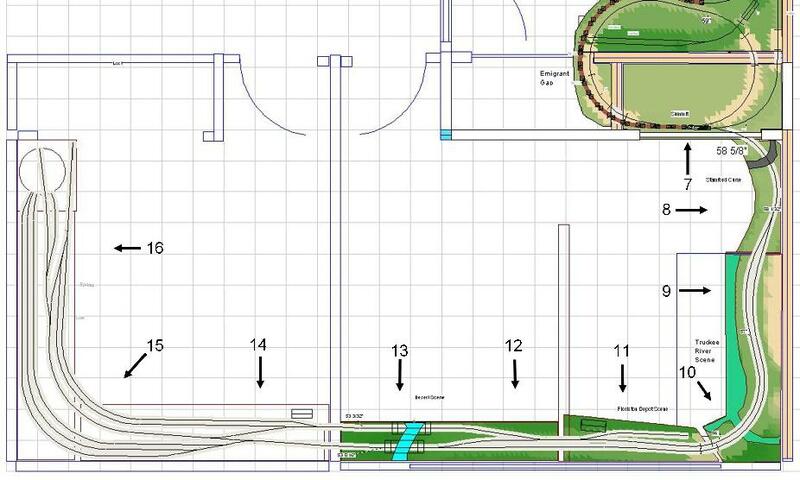 The WP track is in the front and the SP track is behind. 16. The Ogden terminal - eastern end of the line.